We want to meet you on the dance floor – no matter your shape, size, age or experience. 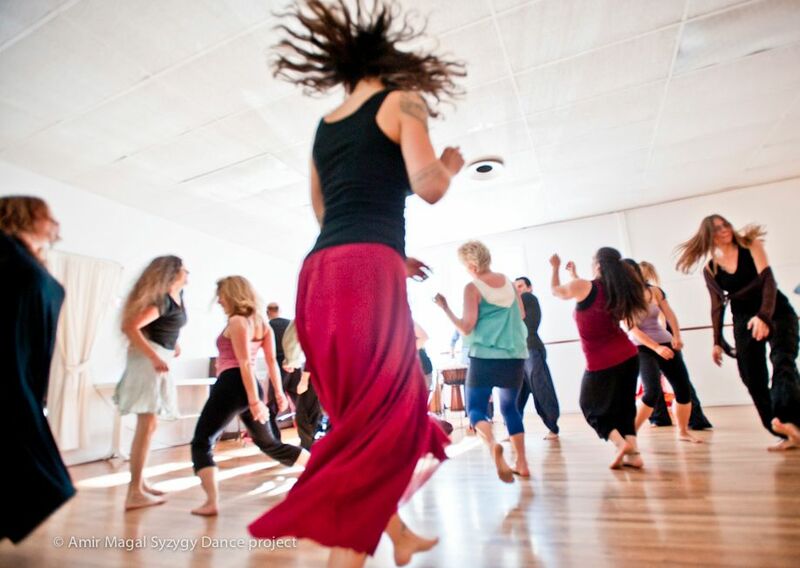 The 5Rhythms is a simple movement practice designed to release the dancer that lives in everybody regardless of shape, size, age or experience. While the practice itself is simple, it has the power to catalyze deep healing and creative expression. As 5Rhythms Founder Gabrielle Roth states, "if you put your psyche in motion, it will heal itself." The five rhythms are Flowing, Staccato, Chaos, Lyrical and Stillness. They come together to create a wave. There are no steps to follow. Each rhythm has a different energy and tempo in which we tap into the wisdom of our bodies, bring awareness to the patterns in ourselves and our lives, and find our own individual expression. In Sylvie’s weekly Wednesday class, you will be led on a journey of self discovery as we come together in community. The class is made up of two waves. The first wave is your time to arrive, let go of your day and settle in to your body. During the second wave we dance more deeply and explore a specific theme. The last class of each month is Sweat Your Prayers™ with minimal guidance. Our bodies hold stories, our head makes up stories, and our hearts feel these stories. Can we access our hearts (and emotions) without giving the stories too much power? Often when we touch in to feelings there’s a story attached to it. What if we could feel anger for anger’s sake - how would the flames dance? What if we could move fear from our chest like sand in an hourglass dripping all the way down into the earth, until there is nothing left? Could water flush sadness from our hearts and make it dance like a river? Could joy give us wings to fly? In this workshop we weave the 5Rhythms with our emotions, calling on our elemental allies of earth, fire, water, air, and ether to guide us on this journey. By separating our emotions from our stories, the stories become our history and our emotions are free to move and dance. By connecting and moving with our emotions, giving them voice and shapes, we unlock the heart and release its limitless power to heal. “Sylvie's class is a wonderful dance experience, integrating movement, fun, self-expression and deep connection (if you wish to) with others in a language we forget to use - physical movement/dance. You definitely don't have to be a good dancer to do this; it's a safe, total acceptance environment. I've been going religiously for 5 years. Sometimes it's the highlight of my week!"